On the 2.4L it is located under the hood just behind the oil dipstick. It is a cartridge filter that requires a 1 1/4 " socket to remove the filter cap. It's located next to the dip stick you will need a 1 1/4 socket to remove it. Oil filter is under the black cap right behind the dip stick. The 2011 Regal does have an electric power steering pump. 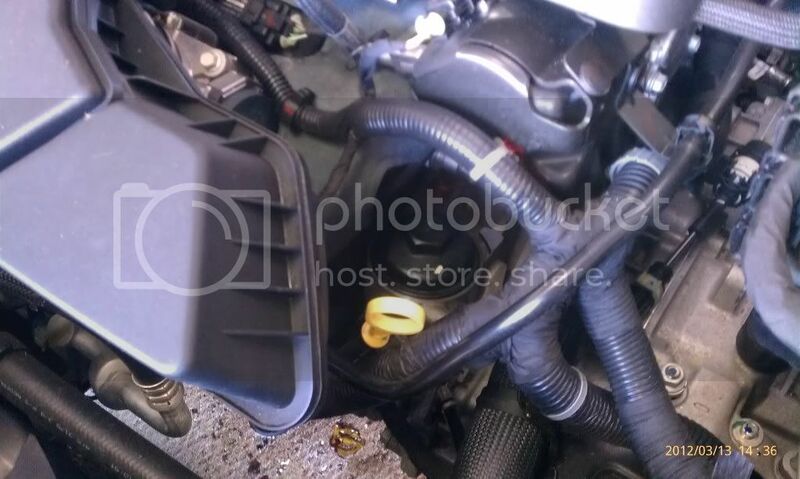 Also, The oil filter is located on the driver's side upper portion of the engine. It is a cartridge type oil filter. The serpentine belt only runs the air conditioner, water pump and alternator. According to the Buick driver's handbook only the 2.0 w/turbo has electric power steering. The 2.4 has a pump with reservoir in-front of the battery box. Latest model 2011 Buick regal vehicle has a computer system integrated that indicates when to change the engine oil and filter. This calculation is based on engine revolutions and engine temperature, and not on mileage. Based on driving conditions, the mileage at which an oil change is indicated can vary considerably. For the oil life system to work properly, the system must be reset every time the oil is changed. When the system has calculated that oil life has been diminished, it indicates that an oil change is necessary. A CHANGE ENGINE OIL SOON message comes on.Please dont ignore this message. If oil change is not done on time then it can further lead to major engine failure problems. Change the oil as soon as possible within the next 1 000 km (600 miles). It is possible that, if driving under the best conditions, the oil life system might not indicate that an oil change is necessary for over a year. However,its suggested that the engine oil and filter must be changed at least once a year and at this time the system must be reset. It can be done by dealer or from at professional Auto repair garages.Your dealer has trained service people who will perform this work using genuine parts and reset the system. It is also important to check the oil regularly and keep it at the proper level. If the system is ever reset accidentally, the oil must be changed at 5 000 km (3,000 miles) since the last oil change. Remember to reset the oil life system whenever the oil is changed. The 2011 Regal requires a very specific kind of Synthetic Oil. It is 5W-30 in viscosity but it HAS to carry the 'dexos 1' designation on the bottle. Dont ignore "dexos 1" This is a new formulation of oil, and has to be licensed by GM, so many oil companies do not have it yet or do not label their bottles with it yet. You can look for the API Service badge for an idea that the oil may be 'dexos 1' compatible. Look for an API standard of SN. This is the most current API level. The only oils I have that are LABELED 'dexos 1' are Castrol Syntec (black bottle) and Syntec Edge (gold bottle).